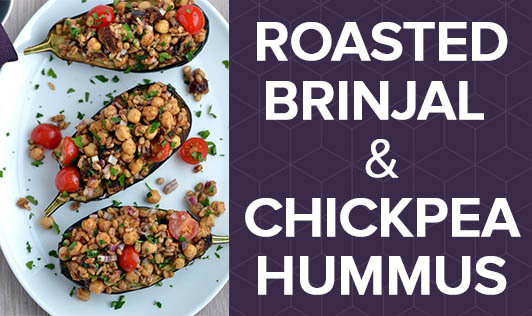 Make your snacks healthy with brinjal & chickpea hummus. Have it as a dip with khakra or vegetable/bread sticks or just have it the traditional way along with your pita bread. • Pre- heat the oven to 200 degree Celsius. • Place the brinjal on the oven sack and roast it for 20-25 minutes till it's a little burnt from the outside. • In case you do not have an oven, roast it directly on the gas till it gets a little burnt from the outside, while turning occasionally. • When the brinjal is cooled, de-skin it and keep aside. • In a food processor, add the cooled brinjal, chickpeas, parsley, lemon juice, garlic, black pepper powder and salt and pulse it coarsely. • Now, start adding 1/3 cup olive oil, while the machine is running and continue till the mixture is soft and creamy. • Serve the hummus in a dipping bowl along with some sliced vegetable sticks or khakra. • Reduce the quantity of olive oil to make it low fat. • You can use low fat hung curd instead of olive oil for a creamy texture.